As a new-comer to the progressive rock world two years ago, the nineties intrigued me as it was a time when prog began to experience a rebirth, and somehow Cairo was presented to me, most likely on Amazon or iTunes. After a sampling of their three albums, I knew it was the first or second I should get because they were harder rocking and closer to my metal roots. 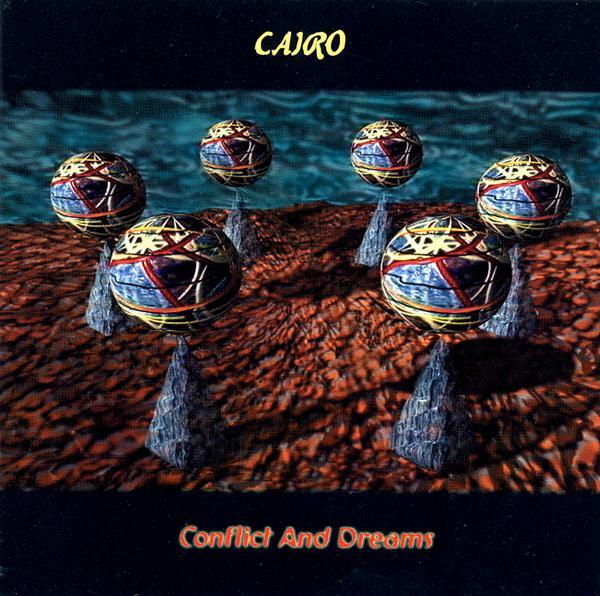 "Conflict and Dreams" is the second album by Cairo, said to be slightly more together than the first and showing the band's development of an individual sound. Based on hard rocking electric guitar, a wild organ, and a fast-paced rhythm section, Cairo's music is a bit like Uriah Heep with more speed and prog than what Heep was actually recording in the nineties. In some ways Cairo could sound a bit like Steve Morse when he rocks out but with a guitar playing style more like a generic metal band than Morse the Great. By every account, this rock out melange of lengthy songs featuring a healthy dose of tempo shifts, time signature changes, flashing fingers across the keyboard, vocal harmonies (at times), and strong melodies played over hard and heavy guitar and punctuated by brief atmospheric intervals of synthesizer now and again should be an absolute delight to my ears. It's almost like Yes on speed! However, my lingering impression of this album after two years is that it is lacking something. The first two tracks come off pretty strong. "Angels of Rage" show the band playing as well as any prog metal band, and "Corridors" has a strong melody and catchy intro, plus more synthesizer to offer a soft contrast to the metal guitar. "Western Desert" shows the band at full tilt, going like a metal version of Glass Hammer almost. Rhythm changes come continuously as the guitar solos dive and slice along with the steady drum beat. But by the time the vocals come in, my first dissatisfaction with the album becomes clear to me: I don't really care for the vocals. Now it's not that he can't sing. Bret Douglas has a strong and powerful voice that well suits the music. It's perhaps the timbre of his voice that doesn't grab me. Realizing this makes it difficult for me to enjoy the sung parts of the songs. Others may not think so. As "Western Desert" moves into a lengthy instrumental section, I also find my mind can't remain focused on the music. A shame really as there are some very nice moments and some great playing. But one thing that tires my patience is really long solo sections. I enjoy prog because epic tracks don't tend to rely on extended jams but instead feature complex and varied music. After the ten-minute mark, I'm looking forward to hearing something new but the theme melody returns and then for a minute or two it sounds like something is up. But then there's just some repetition until nearly the final minute when at last the awaited change occurs, interesting, refreshing, and over way too soon. The only real contrast to show up on the album is the short acoustic instrumental, "Image". It's a pleasant break after 40 minutes of mostly driving hard rock, organ and guitar solos, and appreciable rhythm and melody changes that by now are starting to sound formulated. The last two songs, "Then You Were Gone" and "Valley of the Shadow" continue on in the same vein as most of the album. There are plenty of highlights, like the guitar melody at around 2:30 on "Then You Were Gone" and the almost Deep Purple-esque organ solos or ELP-ish fiery keyboard solo of "Valley". This final song in particular seems intended to be a masochistic finger exercise on organ, piano, and synthesizer. Certainly any one song added to a mixed playlist is likely to impress anyone with a taste for heavy prog or progressive metal. The album is chock full of searing instrumentation, prog rock at its most intense and frenetic at times. But overall the album feels too "samey" to me. Perhaps if I liked the vocals more I might regard the album more highly. I'm not surprised to see that some have awarded "Conflict and Dreams" with four stars. It's worthy of it. For me, however, three stars is the maximum as I still can't really warm up to it enough..